Deborah, I was so torn about which gardens to visit and what to do last weekend. An abundance of choice! We were at Barry’s garden on Sunday, and working in our community garden on Saturday, so sadly I had to give Marion’s a miss. Thanks for the tour. Yes, foliage colour! And trees. Lots of great lessons here. A plethora of choices, isn’t that always the way. Either there is nothing, or too many. Maybe you can make it in May. Sure is fantastic being able to visit so many gardens through the blogworld portal. Lovely ! Thanks for the tour ! 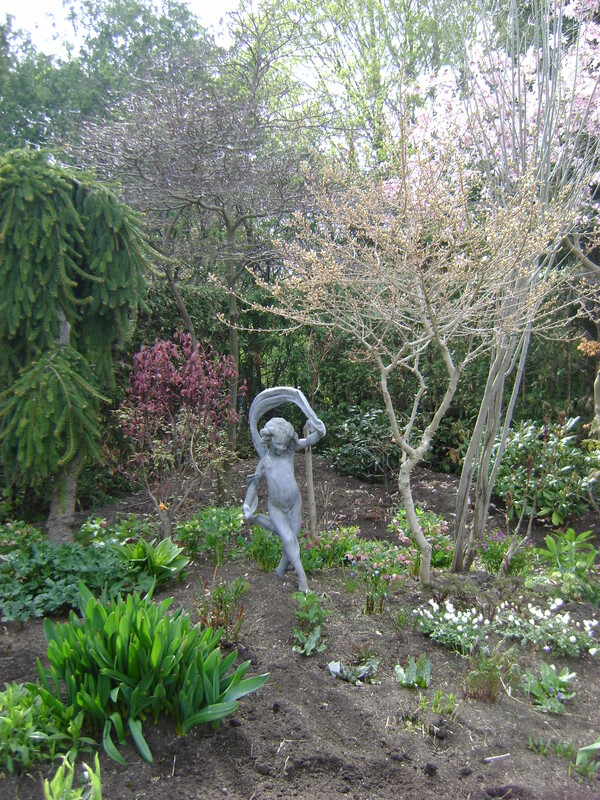 I love garden tours (especially your snowdrop tour), you get so many great ideas. 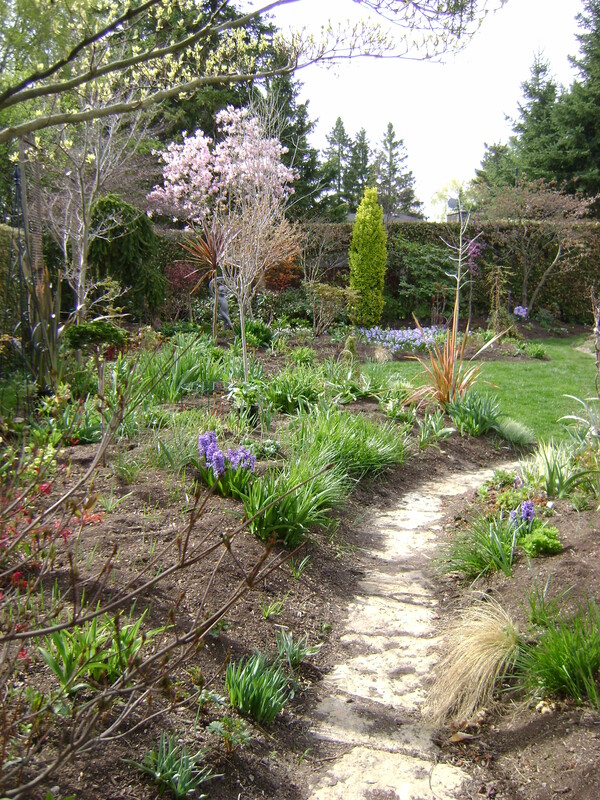 A lovely garden, even as it emerges in early spring. It must be spectacular all filled out in high summer. 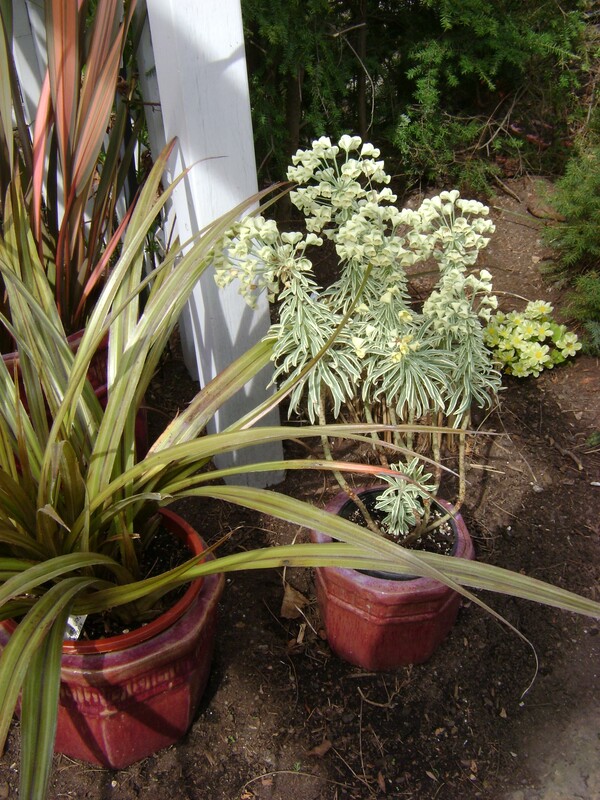 I’m just learning to use foliage for spring color — I just planted a Japanese maple Orange Dream, and already it pops in the garden as it leafs out, just like your photos in this post. Nice. 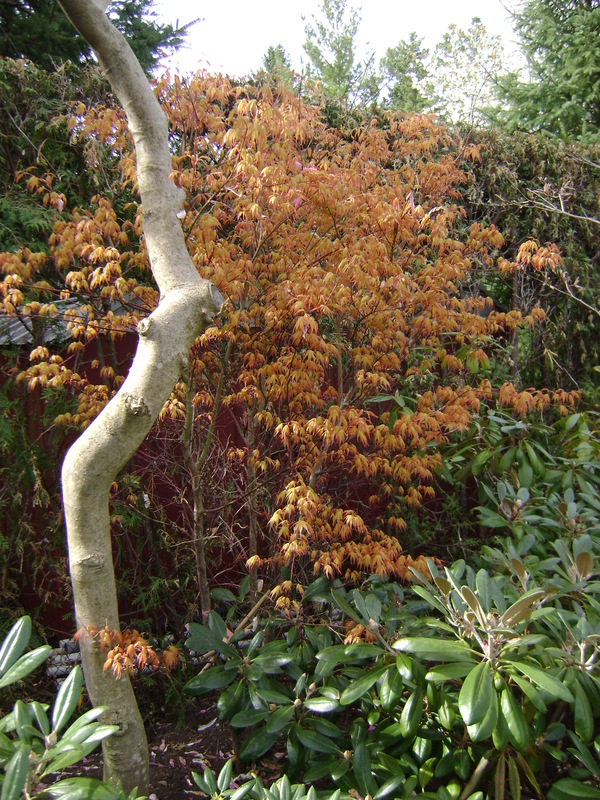 Laurrie, I was impressed with all the colour as it was leafing out, mine is so green. I shall have to look for some coloured foliage trees and shrubs, and especially that Orange Dream, sounds yummy! Thank you for this lovely tour Deborah! 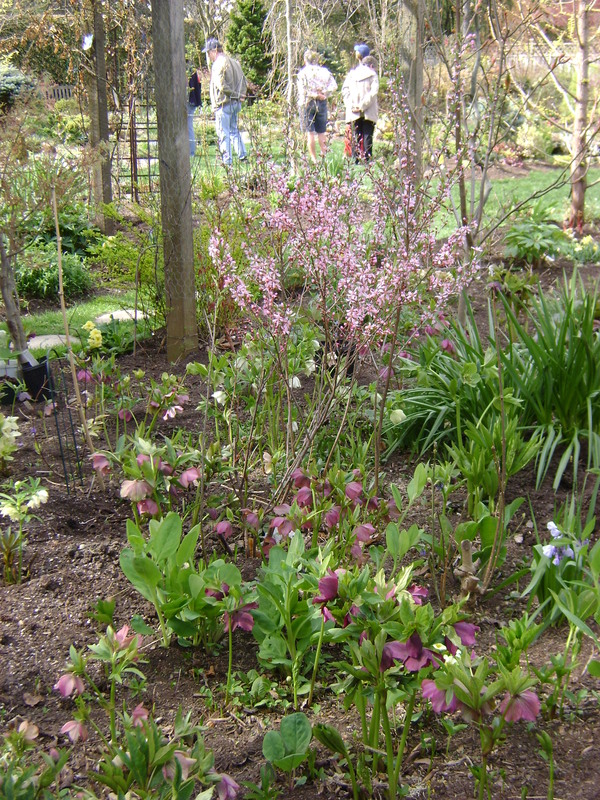 Gorgeous garden… I love the hellebores, Japanese Maples and the other small trees and shrubs now offering leaf or flower color and form to the garden’s beauty. Marion, loves trees and shrubs, it is amazing how many she has in such a small urban garden. M, I have no problem checking it out in the summer, now that I have my orders, how could I do otherwise, lol. She really made me give more thought to some new trees/shrubs for my garden. Would love to see that garden cheek to cheek, as you say. Hopefully, you’ll be able to make it later in the season to share with us. She is open again in May, July and September, I will try and get back in the summer, and (hopefully) take pictures from the same angles. Then you will get a really good idea of how crammed it is. Thanks for the wonderful tour, what an incredible garden. The massive pot is so striking, and the nameless flowers at the bottom of your post are beautiful. Big is better, eh, Rebecca, lol. 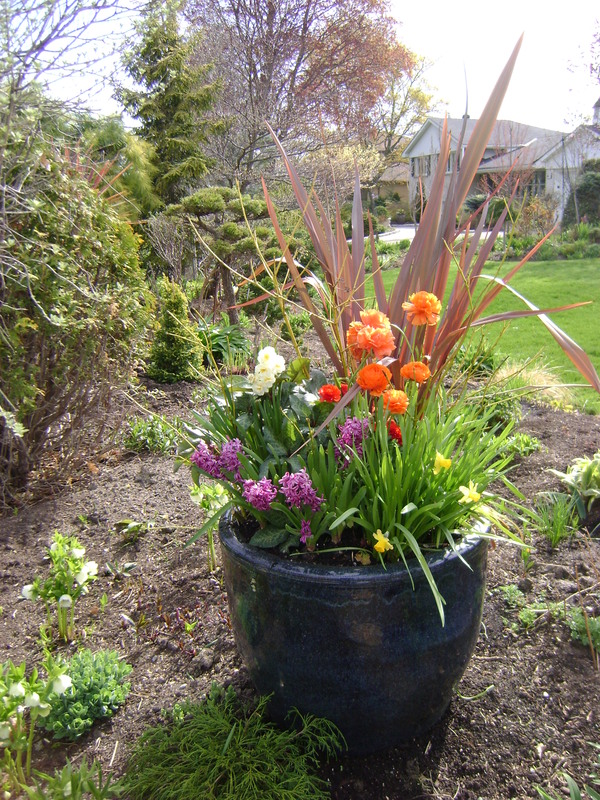 One huge pot, is so much more eyecatching than a lot of little ones, another design lesson. Oh Deborah what a beautiful garden to visit. I would have loved to have been there with you. Then there would have been 2 of us drooling over that most beautiful of hellebores – it is striking in its colouration isn’t it. You need one of those! I have quite a bit of foliage in my garden – I couldn’t do without it especially from Acers , Cotinus and my ever growing heuchera collection. Did she have any pulmonaria’s still flowering? maybe it was too late as that acer looks as if it has alot more leaves than ours over here. I love the pulmonarias for their foliage colour aswell. Rosie, I want it!!! It is so gorgeous. Maybe when it bulks up, she will be selling divisions of it, I shall have to watch for it. She was selling quite a few different hellebores, but there was a bit of a feeding frenzy over them, and nothing left by the time I got to the front of the queue. She was surrounded by people asking questions, and Ian was waiting impatiently as we were on our way to KG, so I did not get the name of the phoriums, they are all so beautiful. I did not see any pulmonarias flowering, mine are flowering up north, so hers would be finished. What a lovely garden, Deborah! Your photos are a delight — and now I’ve finally found a belle-epoque statue I really want: the pensive lady with the curl snaking down her neck. You’re right about it all filling in quickly; at the Botanical gardens, there are almost no spaces left, and yet at the time of the hellebore blossoming, it looked so bare. Meredith, hopefully, now that you have a picture of the statue you want, you will be able to find her, she is quite lovely, and gets quite hidden as summer approaches. It was a great day for a visit wasn’t it. And thanks for the link to my post. 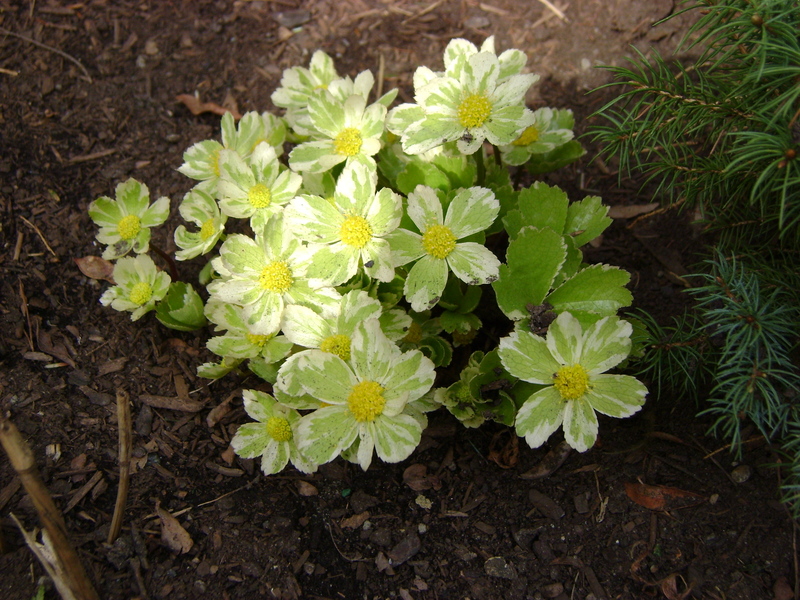 The unidentified plant is Hacquetia epipactis and a variegated form called ‘Thor’. Barry, I knew that you would know, thank you for that. Must catch up and hear all about your garden open. I heard that you had quite a few visitors, in spite of it being a wet day. Oh, oh, it is a slippery slope……I came out of there with a bit of a wish list as well. Then you can say to yourself that it is a display, lol. Cuts down on the price of annuals for your containers! Lovely garden and photos I enjoyed the tour with you. I actually got some snowdrops “in the green” from Marion, I was quite excited by that. I would have loved to buy more, but as we were on our way to KG, the car was already full, darn it! I see where B beat me to the punch in identifying your mystery plant. I know LH had it in their catalogue a few years back but it was god awful pricy! Of course, we hardly quibble about such trivial matters nowaday! I have had a few plesant conversations with MJ in the past, but never had the pleasure of touring her gardens. Definitely one to regale the importance of ‘bones’ in a garden setting, there is a wonderful array of woody materials on display from your wonderful photos. I was surprised though, expecting something much more woodlandish, or perhaps that is just my wishful thinking! I should like to see the same garden in the throes of Autumn, ablaze in its glory! Teza, thank you for letting me know about the “mystery plant”, obviously I can’t afford it, lol. Marian has tons of woodies in her garden, she spends a lot of time pruning, and coppicing, so she can fit them all in. 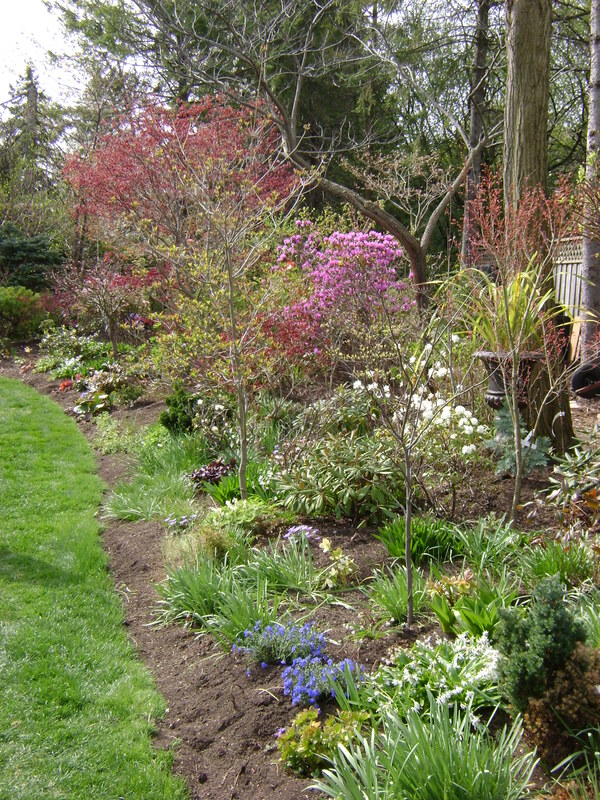 The west side is her woodland garden, the east her perennial and the south, the rock garden. She wants it all! 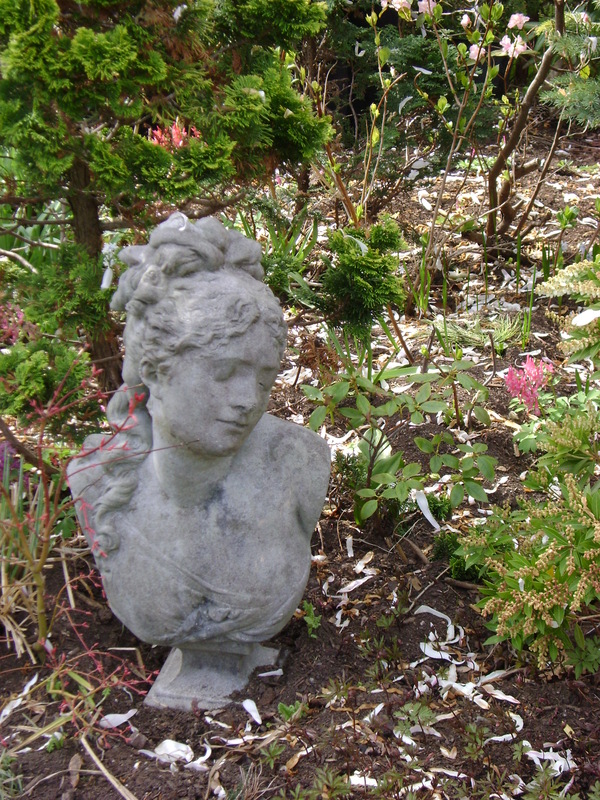 I’ve always wanted to see her garden – your photos are the next bet thing. Just shows you can’t have enough Hellebores! I’m glad that you got to enjoy the pictures of Marians garden at least. She is open 3 more weekends this year, maybe you can make it out. 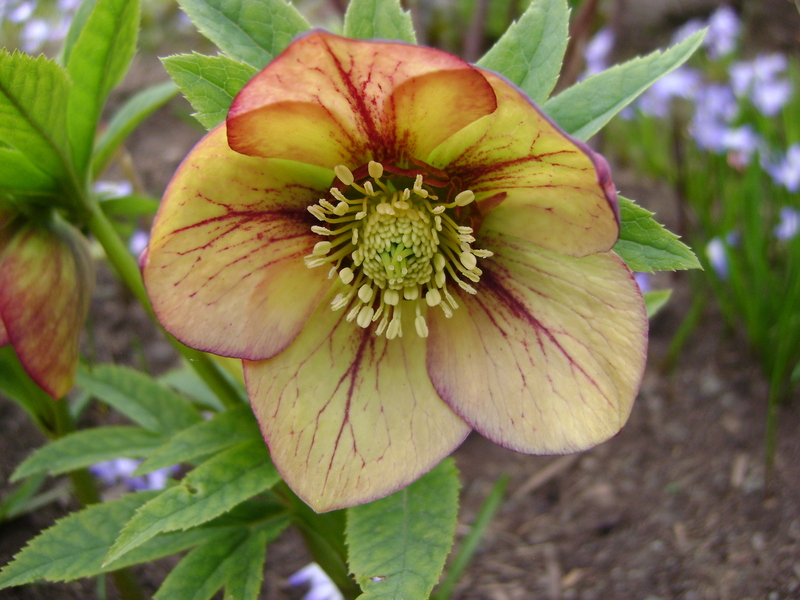 Glad you enjoyed it Racquel, I love hellebores as well. What a beautiful garden and your pictures are wonderful so don’t down rate yourself girl ! 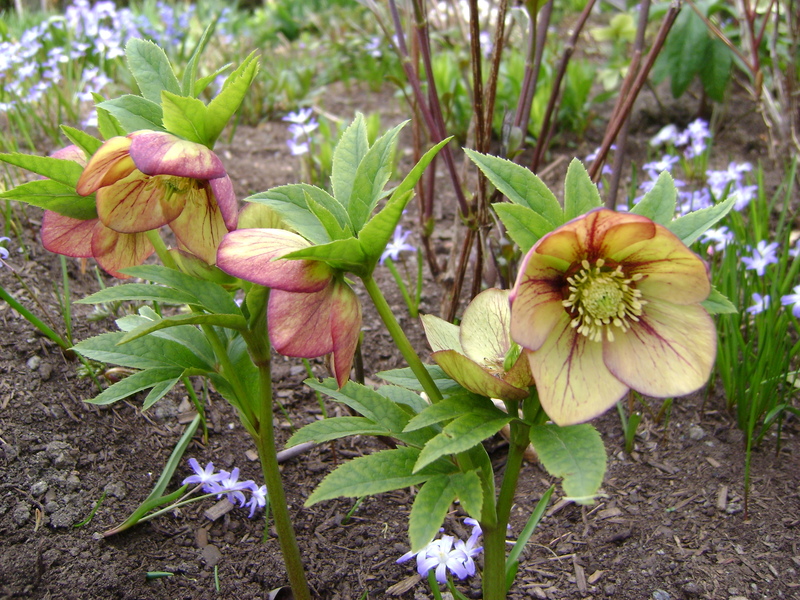 I love the hellebore and did you find out which one that is .. plus what was that other plant underneath that photo ? I would love to know too ! It is hard to get around this time of year isn’t Joy, crazy busy in the garden. I think that you need an orange Japanese maple to fit in with your Hallowe’en theme. That looks like an incredible garden Deborah. I would visit often for inspiration! Definitely HAVE to add a Japanese Maple to my garden THIS year. I’ve done without for far too long. I try to go every year, Kathleen, always find a large number of plants to add to my wish list. Hope to read about your Japanese Maple soon! Deborah, sorry I have been MIA checking in on your blog. That closeup of the burgundy-colored hellebore is outstanding! 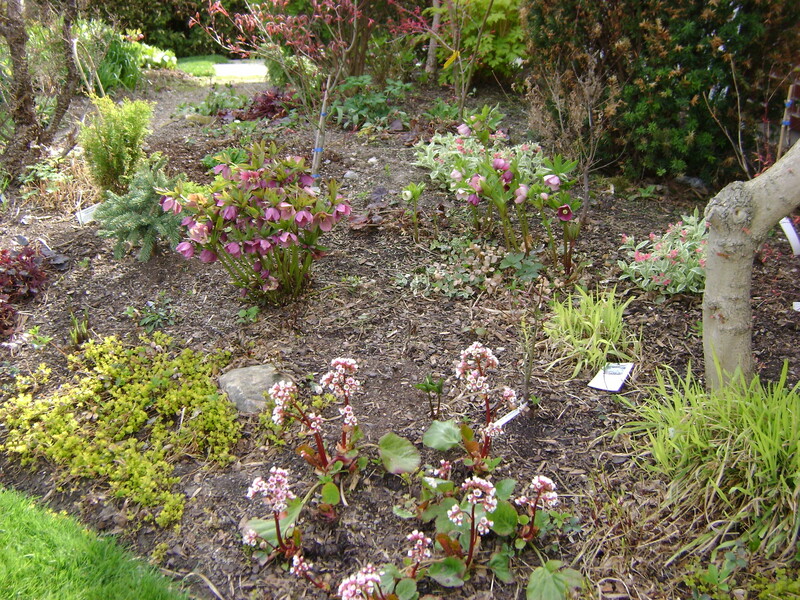 And isn’t it interesting to see how gardens change throughout the seasons. I know it is a busy time of year for you Melissa. Glad you liked the tour! What a gorgeous garden! I absolutely love that last hellebore! I don’t have any that color; must find it! 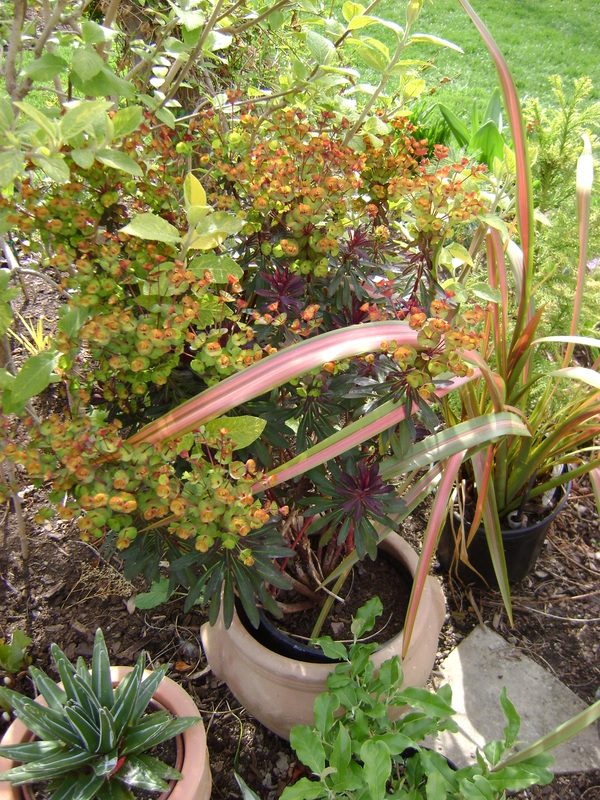 You are so right about the importance of getting color into the garden through the foliage. This garden is an excellent example. Deborah, wasn’t it a gorgeous colour, I so want one as well. The great thing about foliage colour is the longevity, unlike blossoms. 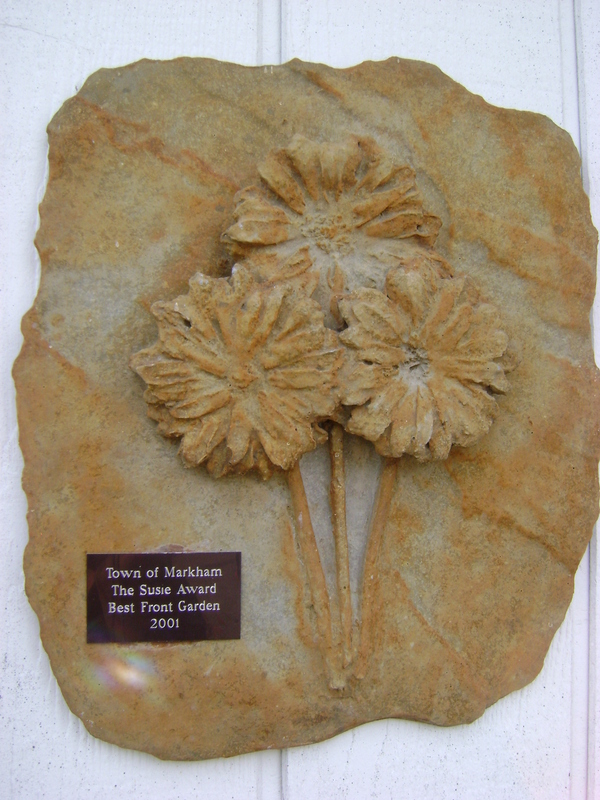 Do visit Marions garden, she is well worth the visit. Also Barry Parker, I wrote a post about him titled hortus deliciarum. 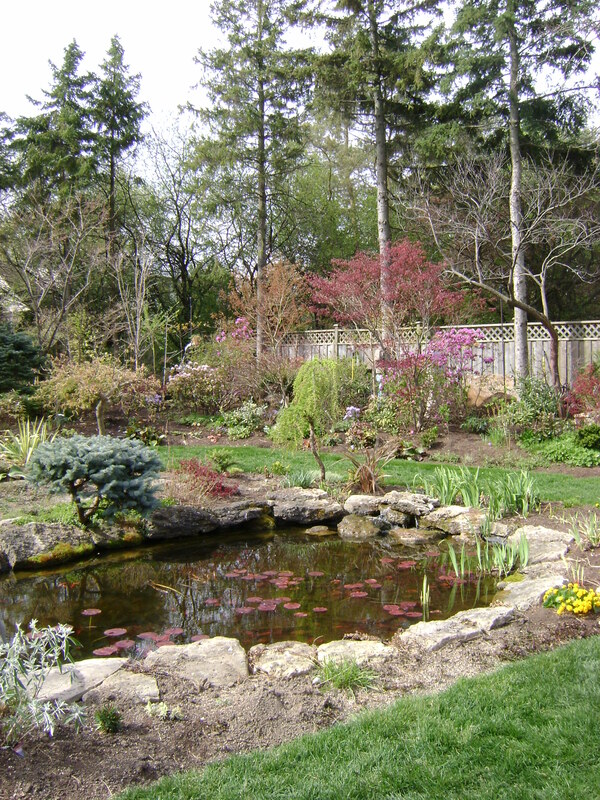 If you look at torontogardens.blogspot.com, Helen and Sarah might have some other recommendations. When are you visiting?